Liquid cooling specialist Aqua Computer has announced a new entry in its Kryographics waterblock family, suitable for Nvidia's Pascal-based Titan X graphics card. Designed to provide cooling to the GPU, VRAM, and voltage regulation modules (VRMs), Aqua Computer's Kryographics Pascal Titan X cooler is built to perform. 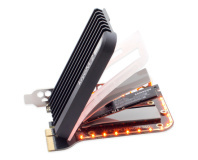 According to the company, its design includes a 'jetplate' cooling block in direct contact with the graphics processing unit (GPU), a bypass channel for reduced resistance post-GPU, and coolant channels which reach all relevant components of the GPU. The waterblock is built from copper, acrylic, and Delrin for the terminals, along with a stainless steel frame and insert. As the company is positioning the waterblock for those with custom cooling setups, no connectors for the G1/4 terminals are included; the package does, however, include a thermal pad, hex nut driver to remove the original heatsink and fan assembly from the card, and sealing plugs for unused inlets and outlets. So far, Aqua Computer has produced only a single variant of the waterblock: plain copper with transparent acrylic, priced at €99.90. The company has, however, confirmed plans to launch a nickel-plated version with smoked acrylic for €114.90 in the coming weeks, along with passive and active backplates priced at €24.90 and €39.90 respectively. More information is available on the official product page.